Belmont Enactus was awarded a $5,000 grant from the Ford Motor Company Fund Wednesday after tying for third place in an international social entrepreneurship contest. The Ford Mobility Innovation Challenge was designed to provide funding to scale a mobility project – a project that addresses affordable, clean transportation systems or mobility issues in a way that helps solve a social problem or urgent community issue. 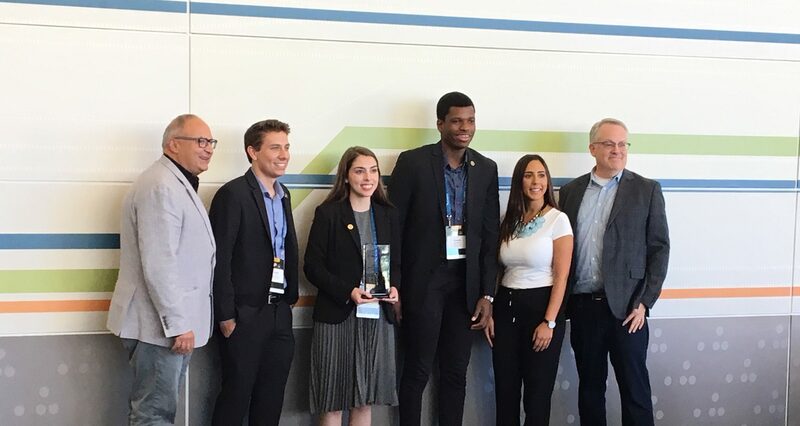 Belmont Enactus students Lucia Clendenin, Oluwatito Ebiwonjumi and Nicholas Chakinis, along with faculty advisor Dr. Cate Loes (College of Business), attended the Enactus World Cup gathering in Palo Alto, California this week, where the pitch competition for $75,000 in grant money took place. The Belmont team was representing their work with Senior Ride Nashville, which supports older adults by keeping them connected to the community and providing mobility for maintaining health and quality of life. The Enactus team has been helping Senior Ride Nashville establish a business plan, financial models and marketing as well as working with the nonprofit on its overall operational structure. Launched last fall, Senior Ride Nashville (SRN) connects caring, reliable volunteer drivers with senior adults who need transportation to medical appointments, grocery stores, barber and beauty shops, pharmacies, community centers and other destinations. Last month the organization provided its 2,000th ride and noted that its services were expanding to include East Nashville in addition to the areas already served in West Nashville, Bellevue, Madison, Donelson, Hermitage and Old Hickory. The Belmont team competed against teams from the United States, Brazil, Morocco and Ghana.